Computer Science + History, B.A. Computer Science + Music, B.A. Computer Science + Political Science, B.A. Computer Science + Theology, B.A. The demand for individuals with expertise in computer science continues to expand. In 2013, 100% of the students who graduated from Lewis' traditional undergraduate computer science program were placed in jobs within two months of graduation, and we see no end in sight for this trend. 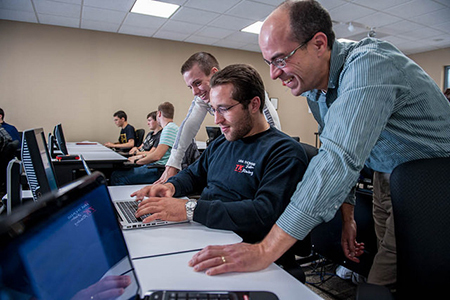 Thanks to Lewis' outstanding reputation in Computer Science and its network of loyal alumni, students have unparalleled access to internship and job opportunities. A Computer Science degree from Lewis is the best choice I've made to prepare myself for anything. Today, I'm employed at a highly respected company that allows me to work to my abilities. And it's all due to the road I paved under the guidance of Lewis faculty." Acquire the programming, networking, cyber security, and problem-solving skills you need to succeed in the high-demand field of computer science. Discover your gateway to advancement. Learn the computing skills that will make you an invaluable asset and secure your future in today’s data-driven world – all from the comfort of your home or office. Cyber security tasks, such as encrypting data, identifying vulnerabilities, detecting intrusions, and sealing holes in computers and networks. You’ll also learn about developing mobile apps, simulations and more. Do you already have some experience coding and programming software? You may qualify for Prior Learning Assessment (PLA) credit that can be applied toward your degree, which means you could graduate early and save money. Because this program is exclusively online, you can learn everything you need to know from the comfort of your home or office. That’s because our innovative LUCSCloud (Lewis University Computer Science Cloud) provides 24/7 online access to our Virtual Machines, allowing you to complete hands-on exercises at your convenience. Why Lewis for Your Bachelor’s in Computer Science? Lewis is ranked as one of U.S. News & World Report's "Top Tier Colleges"